Made with methi and soya flour, this recipe is an excellent dish for diabetics, as it helps in reducing their blood glucose levels. • Mix sugar and yeast along with 2 tbsps of water in a bowl, cover and keep aside till the yeast swells up. • Mix wheat flour, soya flour, yeast-sugar mixture, salt, oil and fenugreek leaves together in a bowl. Knead it using enough water to make soft, smooth dough. • Cover the dough with a lid or wet muslin cloth and allow it to prove and double in size. 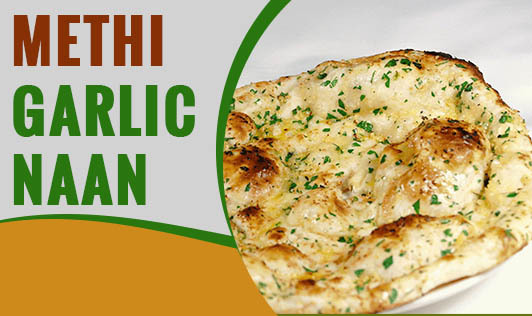 • Take a small portion of dough, sprinkle a little garlic over it and role it into a slightly thick naan. • Heat a non-stick tava and cook the naan on one side till it puffs up slightly and then turn over. • Now cook it on the other side till it puffs up a little and then roast it on an open flame till it turns golden brown on both sides. • Brush the naan with 1/8 tsp of oil and serve immediately.